Ht / Wt: 6'0" / 230 lb. 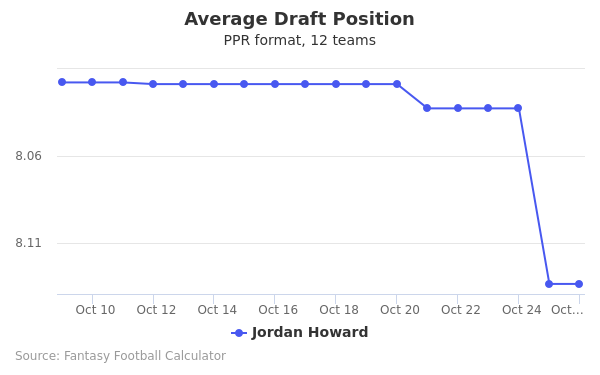 Jordan Howard's fantasy value is measured by his average draft position (ADP) in fantasy football mock drafts. 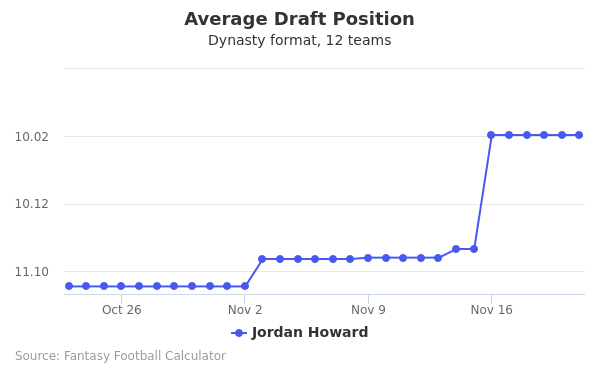 In recent drafts, Howard's current ADP is 6.06, which indicates that his fantasy outlook is to be the 6th pick of the 6th round, and 66th selection overall. 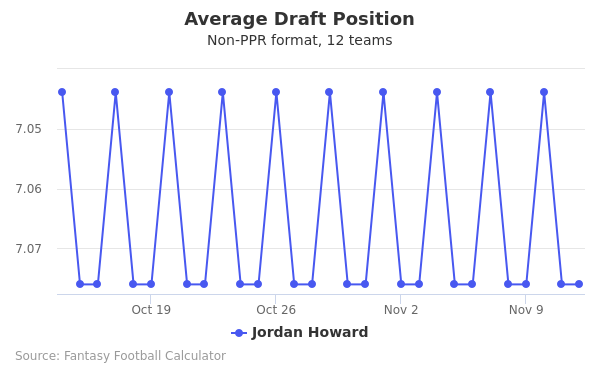 The code below will display a graph that updates every day to show the ADP data for Jordan Howard for the past 30 days in 12-team PPR leagues. Draft Doug Baldwin or Jordan Howard? Draft Jordan Howard or Russell Wilson? Draft Jordan Howard or LeSean McCoy? Draft Jordan Howard or Tyler Lockett? Draft Drew Brees or Jordan Howard? Draft David Njoku or Jordan Howard? Draft D.J. Moore or Jordan Howard? Draft Jordan Howard or Sammy Watkins? Draft Jordan Howard or Rashaad Penny? Draft Jordan Howard or Robby Anderson? Draft Jordan Howard or Kareem Hunt? Draft Corey Davis or Jordan Howard? Draft Jordan Howard or Matt Ryan? Draft Jordan Howard or Vance McDonald? Draft Jordan Howard or Philip Rivers? Draft Jerick McKinnon or Jordan Howard? Draft Carson Wentz or Jordan Howard? Draft Jordan Howard or Peyton Barber? Draft Allen Robinson or Jordan Howard? Draft Chicago Defense or Jordan Howard? Draft Jordan Howard or Latavius Murray? Draft Emmanuel Sanders or Jordan Howard? Draft Jared Goff or Jordan Howard? Draft Christian Kirk or Jordan Howard? Draft Jordan Howard or Josh Jacobs? Start Doug Baldwin or Jordan Howard? Start Jordan Howard or Russell Wilson? Start Jordan Howard or LeSean McCoy? Start Jordan Howard or Tyler Lockett? Start Drew Brees or Jordan Howard? Start David Njoku or Jordan Howard? Start D.J. Moore or Jordan Howard? Start Jordan Howard or Sammy Watkins? Start Jordan Howard or Rashaad Penny? Start Jordan Howard or Robby Anderson? Start Jordan Howard or Kareem Hunt? Start Corey Davis or Jordan Howard? Start Jordan Howard or Matt Ryan? Start Jordan Howard or Vance McDonald? Start Jordan Howard or Philip Rivers? Start Jerick McKinnon or Jordan Howard? Start Carson Wentz or Jordan Howard? 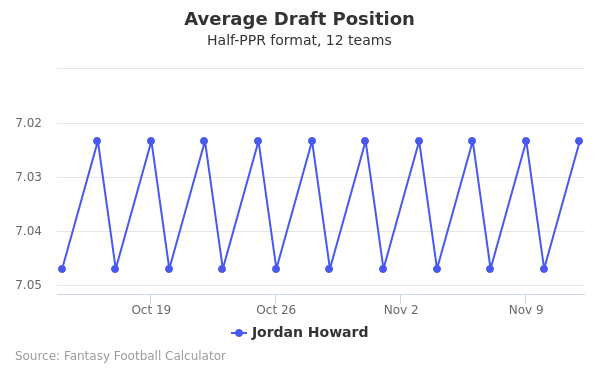 Start Jordan Howard or Peyton Barber? Start Allen Robinson or Jordan Howard? Start Chicago Defense or Jordan Howard? Start Jordan Howard or Latavius Murray? Start Emmanuel Sanders or Jordan Howard? Start Jared Goff or Jordan Howard? Start Christian Kirk or Jordan Howard? Start Jordan Howard or Josh Jacobs? Jordan Reginald Howard was born on November 2, 1994 in Gardendale, Alabama. Even in youth football, his coach said that he was the fastest kid on the field. He started two years for the Gardendale Rockets high school team. During his last two years of high school, he ran a total of two thousand eight hundred seventy six yards. In 2013, Howard began playing for the University of Alabama-Birmingham. His one hundred fifty nine yards rushed against Florida International University would be his season high, and the season total was eight hundred eighty one yards. At six yards per carry, he was second place in Conference USA. His second season with the University of Alabama-Birmingham saw major improvement. He set a school season record of one thousand five hundred eighty seven rushing yards. This allowed him to rank in seventh place in Division One. The University of Alabama-Birmingham shut down their football team, so Howard transferred to Indiana to finish his college career. While there, he had a season high of two hundred thirty eight yards and two touchdowns. He would only play one season for them because he chose to forgo his senior year in order to join the 2015 draft. During the NFL combine, not only was Howard noted for his skilled running but also his versatility. He always chose the best angles to gain the most yards. During the excersizes, he had a vertical jump of thirty four inches. Despite his large physique, he was able to maneuver around in the tightest of areas. Although his running speed was highly regarded, some of the setbacks noted were that he only ran in one speed. That one speed did not allow him to stop easily and he would take big hits, which made scouts question just how prone to injury he would be. On May 9, 2016, the Chicago Bears signed Howard to a four year contract and a salary of $2.8 million. Although he was only supposed to begin the season as the Bears third running back, injuries to the preceding players would mean he got more playing time than anticipated. During his rookie debut against the Philadelphia Eagles, he rushed twenty two yards and had two receptions and nine yards. He got his starter debut against the Detroit Lions, and later in the season, he scored his first career touchdown against the Jacksonville Jaguars. One of the highlights of his first season isbecoming the first rookie in team history to reach one thousand rushing yards. Although the Bears did not have the best of seasons, Howard still ranked eighth in the NFL for rushing. Howard’s father, Bernard “Doc” Howard died in 2007. Since his father’s death, Howard has not only been an outspoken supporter of the Pulmonary Fibrosis Foundation, but he also wears a white t-shirt with his father’s picture on it under his pads.